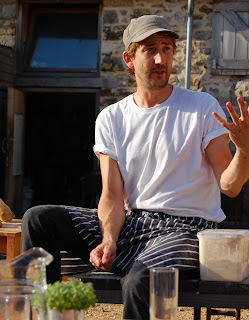 Sure was a glorious day to be down at the River Cottage, that place off the telly run by Hugh Fearnly-Whittingstall. 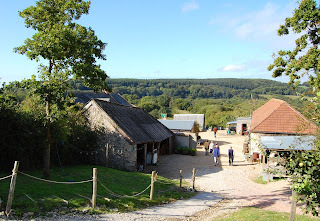 The place is located on the Dorset/Devon borders in this pretty valley, and after leaving your car at the top they ferry you down in a wagon pulled at 3mph by a big ol’ tractor! 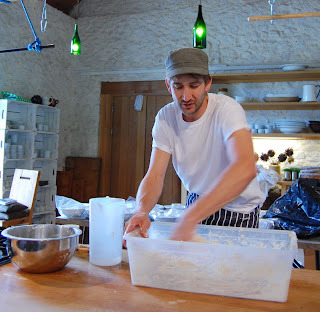 This was the guy teaching us how to bake home-made bread, Daniel Stevens, their head baker. He wasted no time in teaching us about the basic ingredients and showing us how to work the dough. It was a very ‘hands on’ course, as I’d hope it would be, and we all got to make our own loaves from scratch through to finished product. Et voila! 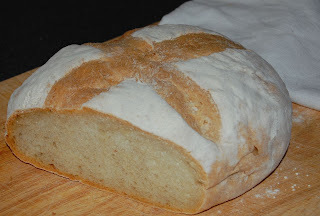 Its made with bakers yeast, rather than sourdough, so the taste is average, however the crumb is really nice and it sprang nicely in the wood-fired oven, which we got to use. 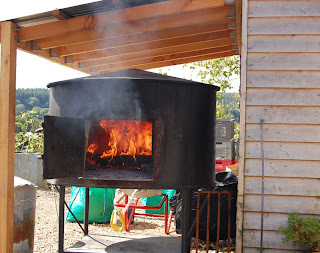 This was the oven at the point when we all had a crack at making pizzas, at its hottest with the burning logs still inside, which resulted in pizzas cooked in about 1 and 1/2 minutes. For our loaves later on, the logs were removed and the oven allowed to cool a bit. For me personally it was valuable to hear about and practice the technique Dan uses, since it differs from what I’ve learned so far in some ways. I also picked up a few ideas, tips etc, which are always handy and got to sample pizza the way it should be – thin, scorching hot and totally fresh! They even fed us a full lunch too, consisting of roasted local lamb leg with spinach and chickpea stew, which was delish. Very slick operation overall, whilst nicely informal and very enjoyable in terms of the event and the venue generally. This entry was posted in river cottage. Bookmark the permalink.